Want to feel happier, more energetic and generally healthier? Experience the joy of graceful movement in a ballet class designed for older dancers, beginners to more experienced. This class is based on the model of a regular ballet class but modified slightly focusing more on balance, co-ordination and fitness. Senior ballet classes are lower impact than a regular ballet class. We begin with some barre work as the warm up. In the centre we will focus on technique and balance. You will also learn some basic repertoire from different ballets; learning a bit about the history of ballet. This class is a great way to meet new like minded people, have fun and learn something new. This senior ballet class will help improve your posture, brain and memory. It will also improve bodily control and awareness, flexibility, and physical and overall well-being. No bookings required, with Georgia Powley (Royal New Zealand Ballet). Wear comfortable exercise clothes, or dance wear if you have it. A pair of fine socks will suffice for ballet shoes. And arrive about 15 minutes ahead to register for the class (parking in the city is awkward sometimes). 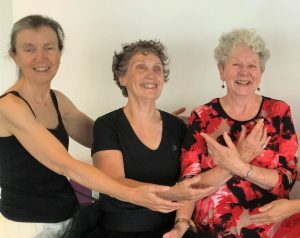 Here’s an excellent news story about a senior ballet class in Brisbane. This class is based on the model of a regular ballet class but modified slightly focusing more on balance, co-ordination and fitness. Senior ballet classes are lower impact than a regular ballet class. We begin with some barre work as the warm up. In the centre we will focus on technique and balance. You will also learn some basic repertoire from different ballets; learning a bit about the history of ballet.